Enjoy our very supple and waterproof softshell fabric for jacket, rain clothes and cardigan. Discover the cute and pratical dark blue Pop skulls softshell fabric ; with its soft dark blue fleece side and water repellent side, it will ensure optimum comfort ! 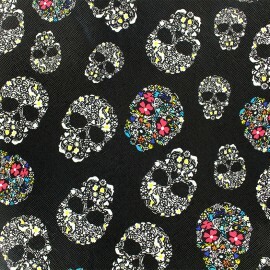 Immerse yourself in the heart of the "Dia de los Muertos" in Mexico with this Sugar skulls patterned cotton fabric with a black background. These colorful and flowery Mexican skulls will add color and a touch of originality to your creations and make little dresses, tops and pajamas, but also rebellious children decor! 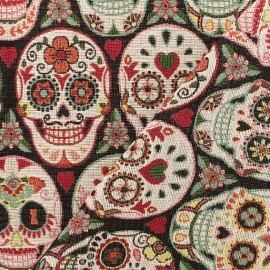 Fall for this Dia de muertos 100% cotton fabric with mexiacan skulls patterns. 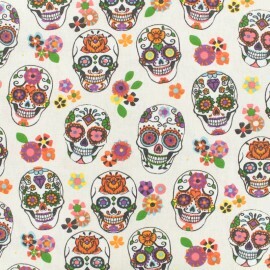 Make original c lothes and accessories with this fabric covered with a colorful and flowery skulls like in the mexican tradition ! 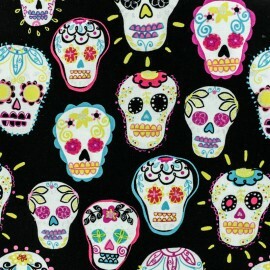 Immerse yourself in the heart of the "Dia de los Muertos" in Mexico with this patterned cotton fabric with a black background. 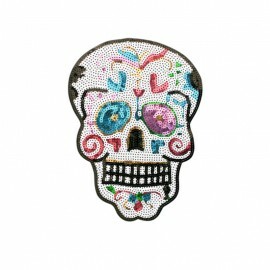 These colorful and glitter Mexican skulls will add color and a touch of originality to your creations and make little dresses, tops and pajamas, but also rebellious children decor! 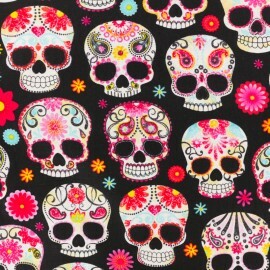 Immerse yourself in the heart of the "Dia de los Muertos" in Mexico with this patterned cotton fabric with a black background. These colorful and flowery Mexican skulls will add color and a touch of originality to your creations and make little dresses, tops and pajamas, but also rebellious children decor! 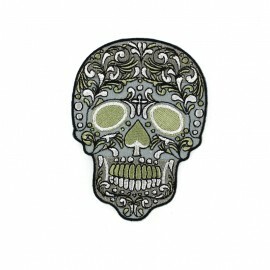 Give style to your sweaters, backpacks and accessories with the Dia Muertos iron-on patch from the Mexico Collection. This collection of round stickers is made in Europe and is inspired by the Mexican culture. 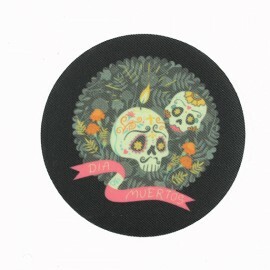 Embellish your clothes with this beautiful sticker on the famous Mexican Day of the Dead (el dia de los muertos). 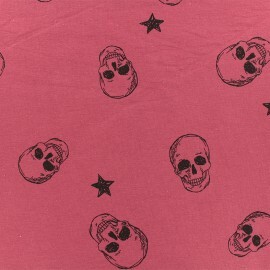 Disover this amazing Rock'n skull jersey fabric with stars and skulls on a red background, perfect to create original tops and T-shirts for you or your kids! 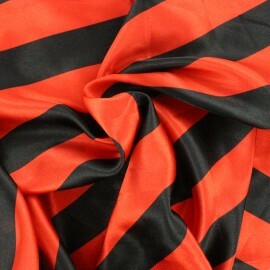 Resistant and sweet this original jersey will give identity to your sewing projects ! 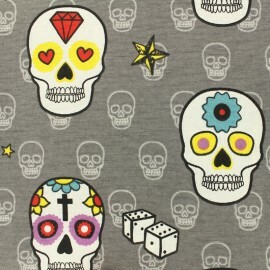 This jersey fabric with mexican skulls on a dark grey background is perfect to create original tops and T-shirts for you or your kids! 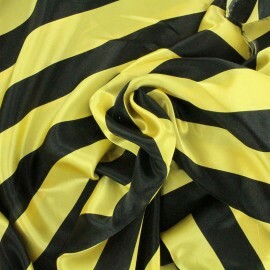 Resistant and sweet this original jersey will give identity to your sewing projects ! 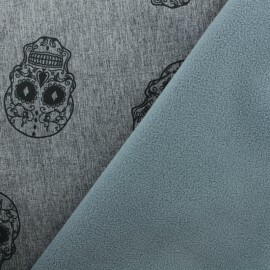 This Skulls light sweatshirt fabric with black skulls on a light grey background is perfect to create trendy and comfy clothes like sweatshirt, dresses ou skirts. A modern pattern for punk creations ! 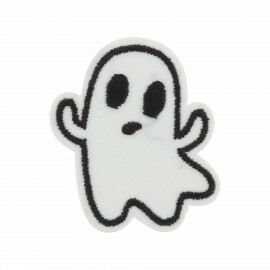 Customize your sweaters, backpacks and accessories with our ghost iron-on patch. 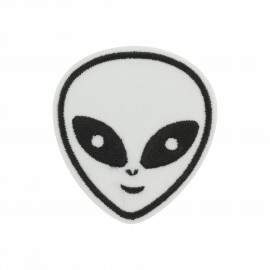 Customize your sweaters, backpacks and accessories with our alien's head iron-on patch. 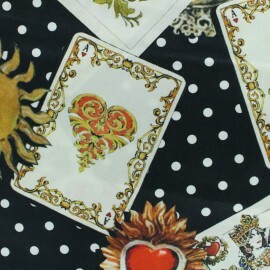 Poly cotton fabric with really wonderful pattern ! We love these skulls inspired by mexican dia de los muertos ! 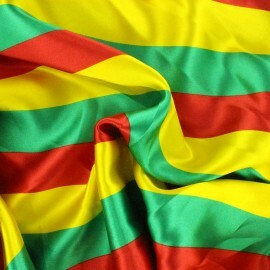 Colors: red, pink, yellow, blue on grey background. 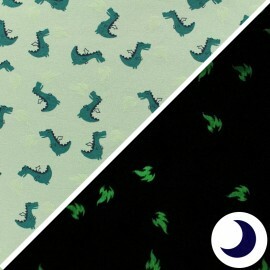 We love this super playful jersey that comes alive at dusk! common in the day, some elements are revealed in the dark. Bring some magic to your outfits! Cinco de Mayo blue polyester button with skull pattern for your events, Mexican inspired occasion and more. Available in 9 colors. Cinco de Mayo turquoise polyester button with skull pattern for your events, Mexican inspired occasion and more. Available in 9 colors. 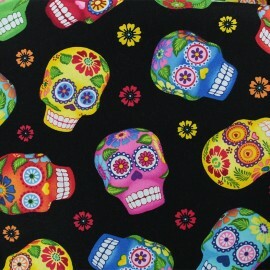 Cinco de Mayo mint polyester button with skull pattern for your events, Mexican inspired occasion and more. Available in 9 colors. Cinco de Mayo khaki polyester button with skull pattern for your events, Mexican inspired occasion and more. Available in 9 colors. Cinco de Mayo yellow polyester button with skull pattern for your events, Mexican inspired occasion and more. Available in 9 colors. Cinco de Mayo orange-red polyester button with skull pattern for your events, Mexican inspired occasion and more. Available in 9 colors. Cinco de Mayo fuchsia polyester button with skull pattern for your events, Mexican inspired occasion and more. Available in 9 colors. Cinco de Mayo white polyester button with skull pattern for your events, Mexican inspired occasion and more. Available in 9 colors. 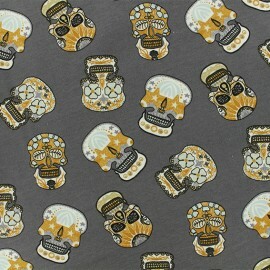 Cinco de Mayo grey polyester button with skull pattern for your events, Mexican inspired occasion and more. Available in 9 colors. 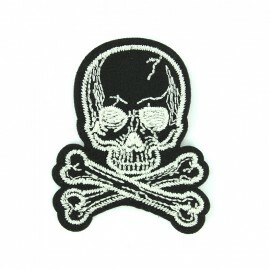 Discover our silver arabesque skull iron-on patch to stick or sew on your pretty jeans or basic jackets! 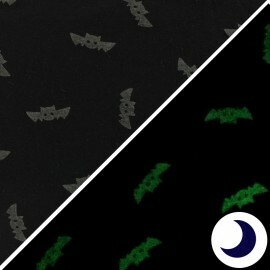 Choose a trendy fashion fabric to apply your patch, you can also choose a plain cotton fabric or a plain light sweatshirt fabric to enhance it. 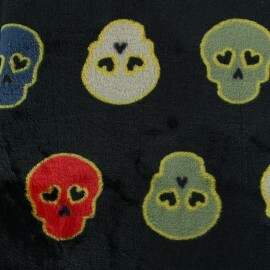 Fan of the skull pattern? 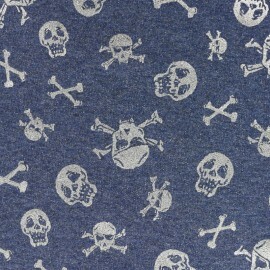 Find the pretty skull cotton fabric or our skull iron-on. 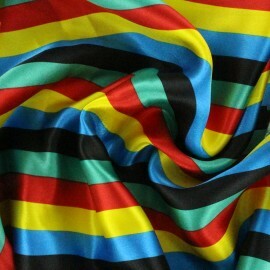 Enjoy this amazing coated cotton material for your interior design (tablecloth, cushions ...). We love this skull pattern on a red background! 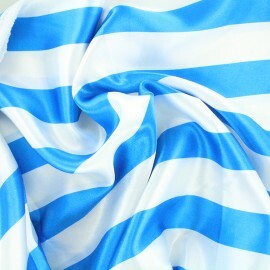 Enjoy this amazing coated cotton material for your interior design (tablecloth, cushions ...). 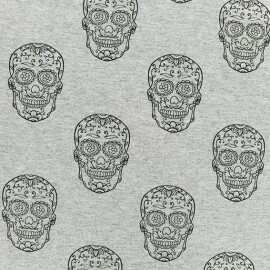 We love this skull pattern on a grey background! 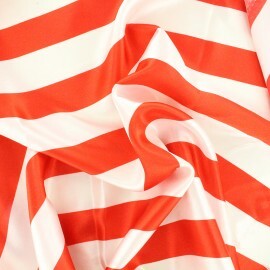 Enjoy this amazing coated cotton material for your interior design (tablecloth, cushions ...). We love this skull pattern on a ivory background! 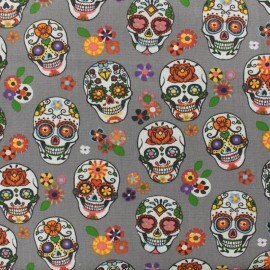 Cotton fabric skull - grey x 10cm Soft and resistant, ideal to make accessories. 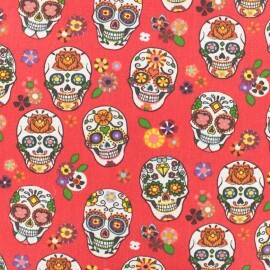 Cotton fabric skull - red x 10cm Soft and resistant, ideal to make accessories. Lovely light sweat fabric with a funny and cute pattern ! 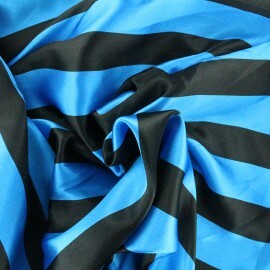 This nice elastic and soft fabric will be perfect for all types of clothes : tee-shirt, dress, skirt, jogging... Very confortable ! You'll find the thermo-adhesive patch everywhere ! 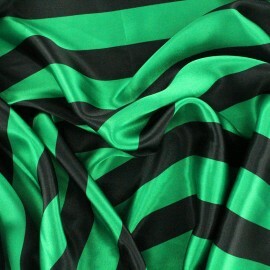 Very trendy you can see it on jackets, t-shirts, clutches, bags and many other accessories and clothes! A round sewing button of 18 mm with a slight relief of 2 mm which represents a white skull on a black background. 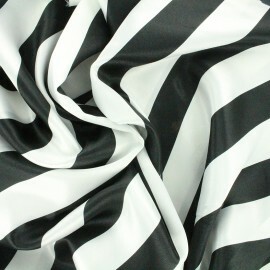 Our crazy stripes fabric will be perfect for your costume creations ! 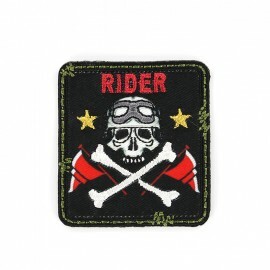 Fantasy iron on patch, ideal to customize and personalize your creations. 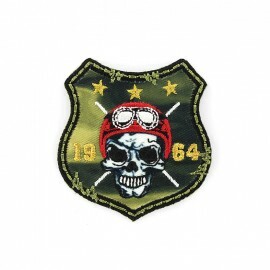 This iron on patch will be perfect on your bomber jacket to enjoy the timeless biker spirit!